An article from May 13, 2016 in Firefighter Basics titled “Laddering with Purpose Part 3: Engine Support” brought to my attention the benefits of advancing hoselines over ladders to reach fires above the ground floor. Although we are trained on how to do this, it is a tactic that, along with ladders use, isn’t discussed much or emphasized as having specific benefits (at least where I work) over both-feet-on-the-ground line advancement. Here are a couple of excepts from this fine article that highlight the advantages of advancing hoselines via ladders. One of the most basic and underrated fire attack methods is attacking a fire by advancing attack lines over a ladder. Lines over ladders has been marginalized in favor of what are perceived as simpler and safer tactics. There is absolutely nothing safe about running all attack lines through the same door and up the same stairway. All that is accomplished is a stairway cluttered with attack lines that makes ingress and egress more dangerous and any RIT operations through that path more time consuming. If collapse, falling glass or anything else happens near that one path the lines are run, they will all be lost. 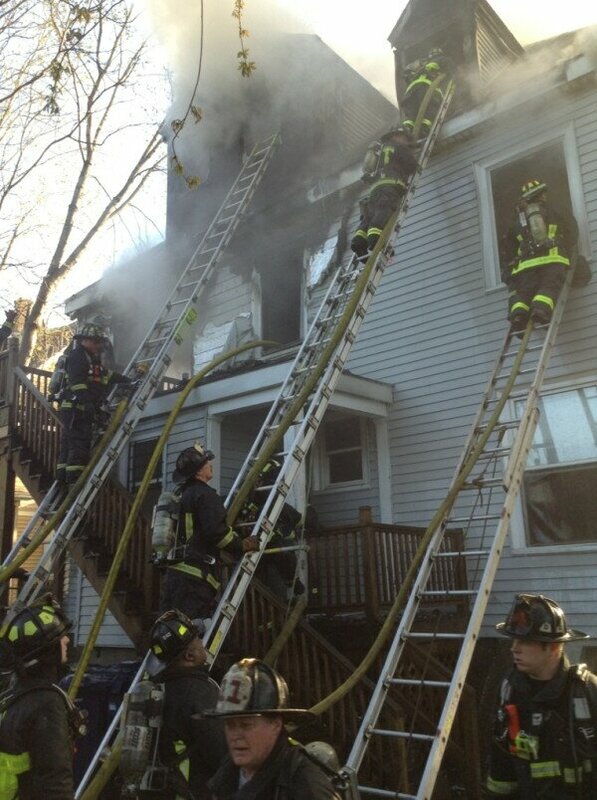 There is no more direct route to the seat of fire on a non-standpiped building than over a ground ladder. Granted this method has its limitations such as elevation. But running lines 3-4 stories up a stairway isn't most efficient use of limited resources. When it comes to advancing lines over aerial devices, however, the drawbacks may outweigh the benefits. Again, “Laddering with Purpose…” brings these issues to the forefront. Advancing attack lines over an aerial device should be avoided. It renders the aerial useless for its many other uses such as rescue, access and egress. Elevated master streams are a different evolution and if those tactics are decided upon all the other uses for the aerial will most likely not be needed during that time. But to tie up an aerial for advancing a line is a waste of equipment. If an aerial is the only option and an attack will not be mounted from the device, then use it only as access and run the line down the side of the building instead of up the ladder. More thoughts for the toolbox. Thanks Firefighter Basics!